The magnificent Borobudur temple is the world’s biggest Buddhist monument, an ancient site widely considered to be one of the world’s seven wonders. Built in the 9th century during the reign of the Syailendra dynasty, the temple’s design in Gupta architecture reflects India’s influence on the region, yet there are enough indigenous scenes and elements incorporated to make Borobudur uniquely Indonesian. This awe inspiring monument is truly a marvel. After a visit here you will understand why it is Indonesia’s most visited tourist attraction and a famous icon of Indonesia’s cultural heritage. 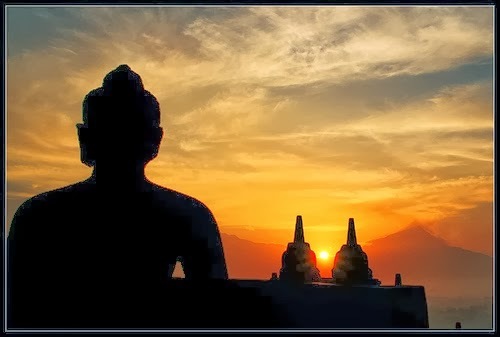 You can see the beautiful view of Borobudur Temple at sunrise started at 4.00 am to 6.00 am with the additional charge. Also you can see the exotic sunset inside the Borobudur Temple park at 5.00 pm to 6.00 pm.